Very rarely do we find an original voice like Mickey J Meyer in the world of cine music. From the very beginning of his career, Mickey has delivered songs that are soothing, mellifluous and unique. “Happy Days”, “Leader”, “Kotha Bangaru Lokam”, “Seethamma Vakitlo Sirimalle Chettu”, “Mukunda”, “Kerintha” and “Subramanyam For Sale”… the movies that he did are enough to say what inimitable talent he has. The impeccable quality of Mickey is he gives songs that are foot tapping at the same time provides honey-dipped melodies. And words can be clearly heard in his songs. 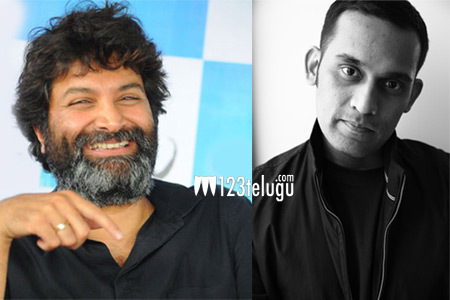 This is what made director Trivikram team up with him. Who needs an introduction to the caliber of magician of words Trivikram? A director par excellence, a writer with impeccable record, a star status that is equal to big heroes, Trivikram has proved time and again that he makes movies with sensible stories and amazing music. Right from his first film “Nuvve Nuvve” to his recent “S/o Satyamurthy”, all his movies are musical blockbusters. Now he teams up with the most happening music director Mickey J Meyer for “A…Aa”. Mickey has already given songs to “A…Aa (Anasuya Ramalingam vs Anand Vihari)” which is now being filmed by Trivikram in his inimitable style. This combination of Trivikram and Mickey J Meyer will sure become one of the best combinations in the annals of Tollywood. It would be an aural and visual treat. The movie is produced by S Radhakrishna on Harika Haasini Creations banner featuring Nithin and Samantha as the lead cast.